The faces move and the hand stands still. Is there a better alternative to Disk Clock Widget? Is Disk Clock Widget really the best app in Science category? Will Disk Clock Widget work good on macOS 10.13.4? Disk Clock... A Clock where the faces move and the hand stands still. Massive internal refactoring. Only visible change is that default disk coloring changed from quarters to halves. Download the last stable version (v.1.0.4). 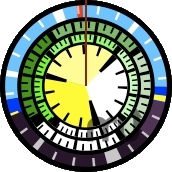 Disk Clock Widget needs a rating. Be the first to rate this app and get the discussion started! There is only one hand. You know where you are - time flows past, with the future and the past uniformly to the right and left. Hours, moons, and years rotate smoothly through their appointed cycles, conveying multiple layers of information. Color denotes season, day of week, hours of daylight, or simply identifies the quarters of more abstract measures.